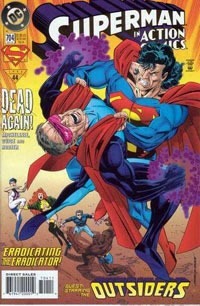 The ’90s Revisited: Superman – Dead Again! 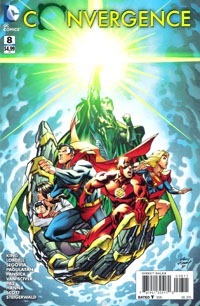 Over the past several weeks, I’ve been reading/rereading complete stories rather than “just” single issues here or there that aren’t connected directly to one another by story or series. The latest instance comes from issues I picked up recently at a sale (Carol and John’s Not At ComicCon 2015 sale). 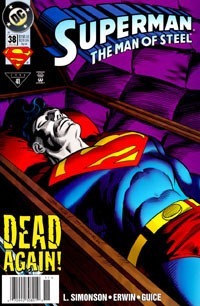 Finding they had a good stock of mid-’90s Superman books–ALL FIVE TITLES–allowed me finally to in one single purchase get the entirety of the Dead Again! arc (which either has not ever been reprinted in collected volume, or at least I do not have said volume). This purchase saved me the hassle of moving then replacing a dozen-some longboxes in a confined space to pull hardly a dozen issues, where I would then have to move and replace the boxes again after reading. Despite seeing issues from this arc here and there over the past several months/years and being interested in re-reading the story in its entirety…it wasn’t until Michael Bailey and Jeffrey Taylor began their coverage of the story on their From Crisis to Crisis podcast that my interest was heightened to the point of action…which combined nicely with the well-timed opportunity of getting the issues and the time to actually read the entirety of the 11-issue arc in two days. 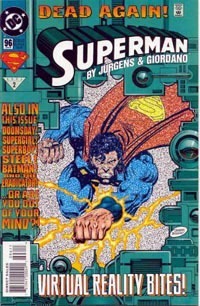 I actually can’t remember the last time I sat down and re-read more than one or two Superman issues in a row, let alone an entire cover-branded storyline like this from the ’90s Superman books. 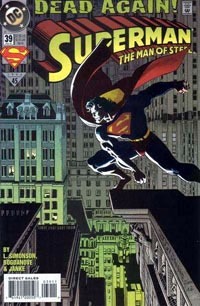 I thoroughly enjoyed the experience, and may next look to The Trial of Superman. I never noticed it as a kid when I originally read this some 20 years ago, but the issues do not line up 100% going from issue to issue the way they probably would if this was being published in 2015. Each issue ends on a some level of cliffhanger/dramatic moment–setting the stage for the next chapter–but then that next chapter didn’t often seem to pick up from the exact same moment. Additionally, some of the narratives of individual chapters would be different stylistically…some straight-forward, others picking up “later” and then flashing back to fill the reader in, then continuing on. The art is also all over the place throughout the arc, and reading it all at once, I noticed the differences from book to book in a way I never had before. All of this is not unexpected, given the multiple titles and creative teams. I rarely went back to re-read issues week-to-week as the issues were coming out, and having a week between issues I don’t recall comparing the visuals to each other all that much…though even back then I’d noticed a personal preference for the art in the Superman title. Dead Again! begins with characters reacting to the fact that a body–one that APPEARS to be the genuine Superman’s–is found in what should have been an EMPTY tomb. 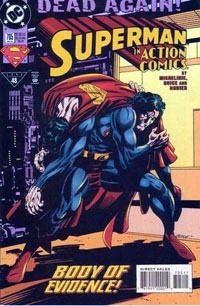 The tomb/room had been damaged in a fight between the current/live Superman and new villain Conduit. Various tests seem to confirm the body as being genuine, leading our active Superman to seek out villains that might be responsible for trickery…after all, he remembers coming back from the dead, being Clark Kent, etc. Other characters react in differing ways–Lois believing him to be genuine, while other characters aren’t so sure (and don’t have Lois’ “insight” into Superman’s genuinity). 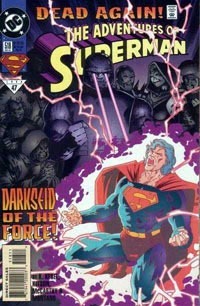 Across the arc, Superman’s search involves Conduit, a new villain named Death Trap, the Eradicator and the Outsiders, STAR Labs, Atom, the New Gods on New Genesis, Darkseid on Apokalips, Mr. Mxyzptlk, the Metropolis SCU, hallucinations, and finally the ultimate villain of the piece (despite seemingly being ruled out on New Genesis) Brainiac himself. 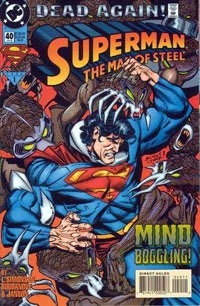 Over the course of the story, we see Superman growing increasingly irrational as the situation drives him closer to sheer madness, as the supporting cast gets more concerned about him and his mental state. We also have a significant subplot as a young orphan–Keith–finds and loses his mother while gaining new foster parents in Perry and Alice White. 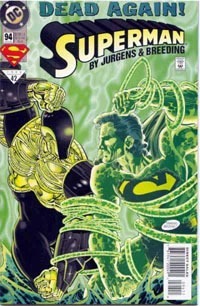 We see the majority of Superman’s rogues gallery, and generally see questions raised and answered regarding whether or not there could have been–if this is–another “imposter” Superman…the possibility that Superman himself, the true Superman might never have actually been resurrected. While I don’t recall this story getting any serious media attention and it does seem largely a footnote in the entirety of the ’90s Superman…this is a pretty significant arc, and an interesting follow-up to stuff. 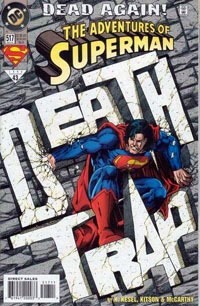 After the Death and Return of Superman “trilogy,” there were a number of smaller arcs and the overall continuing story/”Never Ending Battle” of the multiple titles collectively telling a weekly story…but this seems to be the largest singular story since Superman’s return, and paved the way for the likes of The Death of Clark Kent and The Trial of Superman, as well as (eventually) a number of other several-month arcs that punctuated the ongoing saga. And this is definitely well worth the read if you get a chance! 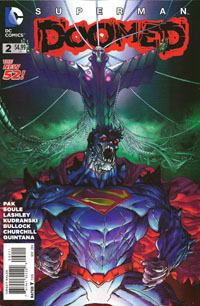 This issue sees the “last stand” of Earth and its heroes against Brainiac. 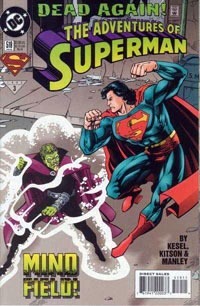 With Superman having given himself over to Doomsday, his “essence” is basically a passenger along for the ride, or in the mind or such, where Brainiac reaches out, showing how much better things would be with Brainiac free to do his thing, why he should be allowed to, etc. Perhaps most pressing is that if Doomsday–Superman–“Superdoom”–destroys Brainiac, it’ll mean the destruction of all human life on Earth, as the stolen minds will be done for and not returned to their bodies. 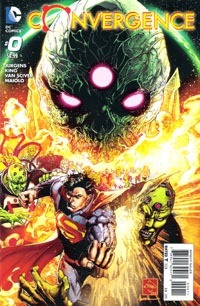 While showing Superman visions of what could be, Brainiac continues taking down the last remnants of Earth’s heroes–having apparently utilized Superman somehow to “find” them and get through their defenses. He also reveals his core, true motivation to things, which on one hand could be sympathetic but for the notion of “the good of the many outweigh the good of the few” and all that. 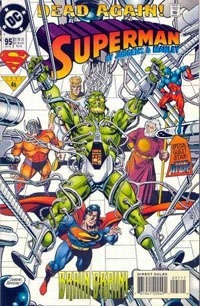 Lois plays a key part in things, and ultimately the minds–and thus lives–of all on Earth rest with Superman and a gambit to take down Brainiac before he can remake the universe itself. Visually, this issue is a jumble. A lot of artists involved, but that can be forgiven as they seem to be utilized for the visions of what-could-be and such. I’ve never been a fan of the “Superdoom” look and have found it ridiculous–still do–so that lends a visual weirdness to stuff for me anyway on top of numerous artists. That said, having made it through all the tie-ins and such to this point–all those styles and renditions of involved characters–I can’t complain too much here. The issue is what it is, and whether utilized to show alternate realities or that’s just a fortuitous element given so many involved, I’ll take it at face value. The only point that I REALLY consciously noticed a huge difference was a sequence that reminded me of Darwyn Cooke‘s art. Story-wise I’m left with a fair bit of frustration at the sheer length of this “event” and such. It seems that SO MUCH was made of the “Doomsday virus” and Superman fighting it/becoming a Doomsday and so on–that Brainiac’s involvement feels like a bait-and-switch. Like this whole thing could have been done in just a couple issues–perhaps Doomed #1, a single month’s slot of tie-ins, then this #2. Then there’s the fact that this issue itself doesn’t even definitively end but rather kicks down the door onto something else. Like this week’s Futures End: Booster Gold issue, this sees to show that in some fashion or another, the DC Universe that *I* grew up on is still out there somehow, and perhaps something involving Brainiac would be a key to–if not bringing it “back,” then at least accessing it. Despite the enormity of what we see on the last pae of the issue, I still don’t feel this story warranted all the chapters it carried, and that this could have been handled in just a handful of issues. 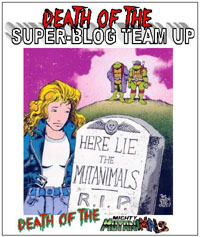 Chances are, with the likes of Bleeding Cool and other online spoilers, this issue will wind up being fairly signifiant in the long run and thus in that regard probably worth seeking out, I wouldn’t particularly recommend it in and of itself unless you’ve been following the story in general. I’m actually (overall) glad I went and hand got it–despite that hefty $5 cover price–for the feelings elicited by that last page, for capping things off, and giving me an “out” to drop back to spending far less each month. Superman: Doomed will probably make for a nice, thick hardcover collection, similarly thick paperback eventually…and really, that’s gonna be the way to go. If you haven’t followed stuff so far, just wait for the collected volume. If it’s priced around $30 for this entire thing, that will be quite a bargain compared to the price paid for the single issues involved, and will put the entire story between two covers instead of the umpteen ones across five-some months for the single issues. I was surprised at this issue. I’m not a huge fan of the Brainiac character, especially the comics version–there have been so many interpretations that it might as well–to me–be outright inconsistency. Geoff Johns attempted to bridge that a few years ago, positing that we’d only essentially seen “avatars” of the one, TRUE Brainiac…but that story came rather late in the pre-New-52 era, and did not really seem to get time to develop. This is my first exposure to the New 52 version of the character, and we get a bit of a blend of past versions. That this version of the character strongly resembles Johns‘ take works well for me; we also see that there are other emissaries out there working for Brainiac. 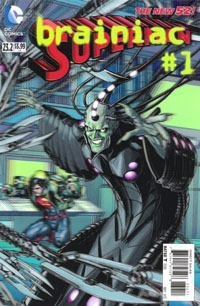 This issue worked QUITE well for me as an origin story, as we see where Brainiac came from and how he got to be what he is and what set him off on his quest to shrink and preserve alien cities. That we get a mix of the 5th dimension (I don’t believe Mxyzptlk has shown up in the New 52 as yet?) and a DC version of the Annihilation Wave (a nice nod to Marvel) tied in to Brainiac gives an interesting depth and motivation to the character. As with all the other villains issues so far, I’m hardly inspired to go seeking OTHER issues beyond this one…but like the Zod issue, my interest is piqued, and I wouldn’t be oppose to reading a full story in collected edition should the occasion arise. I seem to be quite a sucker for this character. Like many people, one of my favorite episodes of the 1990s’ Batman: The Animated Series is the one that introduces a new version of Mr. 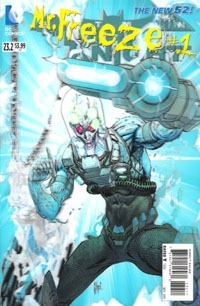 Freeze and gives him a tragic backstory and plausible motivation. I don’t remember the character really appearing in any form in most of the Batman comics I read throughout the ’90s and early 2000s…but when the first New 52 Batman Annual focused on Mr. Freeze amidst the Court of Owls stuff last year, I went ahead and bought it, and quite enjoyed it. It was the memory of that annual that led me to include this issue with the villains issues I’d get, and I wasn’t really let down. This one does less exploration of an origin and more “where the character is now,” actually taking place after the events of Forever Evil #1 and leaves Mr. Freeze “out there” for whatever story he gets involved in next. This was an enjoyable one-shot, and while I wasn’t blwon away by the art, I actually enjoyed the interior more than the cover. I’m no great fan of the Riddler, even though I do rather appreciate some of his riddles as written by whoever’s used the character at the time. 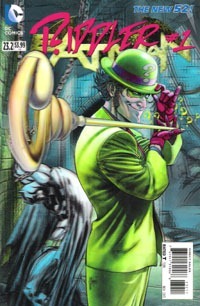 I actually can’t remember ever particularly enjoying any of the Riddler-centric stories in the comics. I had not planned on buying this issue–I intentionally did not include it in the list of requested issues I submitted to my comic shop last week–but when I found myself filling an unexpected gap in what I’d planned on spending, I pulled this from the shelf and added it to the week’s buy. And surprisingly enough, despite really expecting to dislike the issue, I found myself enjoying it. While the story is set somewhere between the ongoing Zero Year stuff I’ve not been reading and whatever comes next in Zero Year, this seemed more like a “timeless” story, and a (morbid as it sounds) “fun” one-shot focused on the Riddler. We see how dangerous he can actually be, yet a hint of depth beyond simply a gimmick…and this, quite frankly, stands out as probably my favorite Riddler issue at this point. At least this week being a “big week” was somewhat planned…though it still proved to be a bit larger than I’d intended. 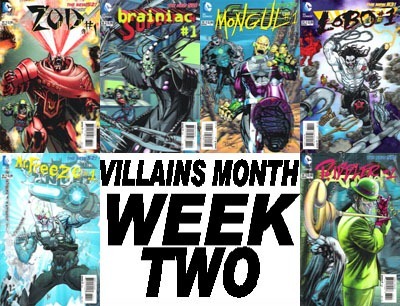 All six of these Villains Month issues are ones that–two weeks ago–I’d had no intention of buying. It’s extremely dismaying to realize that I bought TEN new comics this week (at least DOUBLE what I usually buy in a week!) and they were all $3.99 books. At least these DC Villains issues with the 3-D plastic-ish covers FEEL like they’re actually WORTH the price, physically. They’re regular-sized issues content-wise, but the covers are certainly sturdy, high quality. I’m continuing to enjoy that these are by and large truly one-shot issues. Even though they carry the “point whatever” numbers on the covers tying them to series I’m not actively following, FUNCTIONALLY they remain single-issue stories focused on the titular villain. Some of the issues do say the story continues into a series/issue, but as far as I’m concerned–for what I’m buying these for–I’m rather satisfied with what I’ve got and nothing’s led me to chomp at the bit for another issue or the next appearance…though some have got my interest such that I’ll at least read about issues they might appear in and perhaps pick up a collected volume that I probably wouldn’t otherwise have any interest in prior to all these issues.